In this blog post I’m going to take a step away from the business side of the pharmaceutical industry and dive a little bit deeper in to the science. In March of last year, a paper (paywall) and a poster were published that claimed generic versions of Pfizer’s Lipitor (atorvastatin) had quality problems that may impact public health. The study in question was run by a physician at Brigham and Women’s hospital in Boston by the name of Preston Mason. I don’t know about you, but a study from a very well respected institution such as Brigham and Women’s gets my attention, especially if it concerns drug quality. If you take a closer look at the results, they are quite alarming. The study found that every single generic drug they tested had very high levels of an impurity, sometimes up to 30%! This is a important issue in the industry right now as several foreign generic manufacturers, such as Ranbaxy, have been placed under FDA bans that prevent their drugs from being imported to the United States. This is quite a shocking result as the FDA standards that exist rarely allow more than a few tenths of a percent of impurities in a final product. To find impurity levels as high as 30% would suggest very lax quality standards at these generic manufacturers and would warrant an immediate recall and possible sanctions for the manufacturer. If we dive into the science a little deeper, we see that the impurity that was found was the methyl ester of Lipitor. For those who are not chemists, esters are very simple derivatives of carboxylic acids that are formed from the acid and an alcohol. The diagram below shows how the alcohol is incorporated into the molecule. At first glance the analytical methods used in the paper seem quite robust. 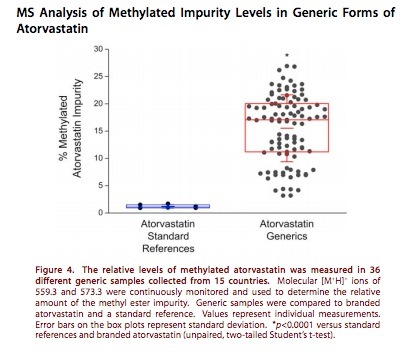 The scientists obtained pure reference samples of both atorvastatin (the active molecule in Lipitor) and the methyl ester impurity. The researchers even went so far as to test the biologic activity of impurity to show that such high levels of the impurity would reduce the effectiveness of the drug. However, if we look a little closer, we find a critical error in the analysis that raises some doubt about the findings. If you examine how the analysis was done, the generic drug samples were prepared for analysis by dissolving them in methanol. This is a pretty typical method to prepare samples, however in this case, this method may have resulted in formation of the impurity itself. If you look at the ester chemistry diagram above, you can see that if methanol reacts with a carboxylic acid, it forms a methyl ester, the impurity in question. However, the authors of this paper did run a control. They took some of the atorvastatin reference material and placed it in methanol for 10 weeks and they did see methyl ester impurity forming, however it was a very slow process (it took 10 weeks to convert 20% of the drug to the ester). Apparently their argument is that since it took 10 weeks to form the methyl ester (and they conducted the analysis of the generic drugs much more quickly than that) that the generic drugs must have had that impurity present from the start. That is where the experimental error was made. The assumption the scientists made is that formation of the methyl ester always happens slowly. However, they only tested this on the pure atorvastatin reference material. The generic drugs that they analyzed contain more than just the active drug, they also contain other compounds used to form the tablet called excipients. Excipients are a class of chemicals that have many uses in tablet manufacturing. They are used as fillers, binders (make sure the tablet doesn’t crumble), coloring and flavoring agents. Excipient selection is very important as you need to ensure that the drug is stable, but that it also dissolves reproducibly when a patient swallows it. The excipients themselves can have a number of different properties, some are basic (alkaline) and some are acidic. If you look at the ester chemistry diagram above, you’ll see the symbol H+, which represents an acid. The formation of esters is catalyzed by acids. What likely happened in this research was that the excipients in the generic drug catalyzed the formation of the methyl ester “impurity” such that after only a few minutes in methanol a large amount of the methyl ester was formed. How could these researchers test that theory? Simply use a different alcohol in the preparation of the generic drug samples. If they used an alcohol like ethanol (ethyl alcohol), they very likely would have seen an ethyl ester impurity instead of the methyl ester, which would prove that the “impurity” was being formed by their analytic method, not by the manufacturer of the drug. This paper is a great example of why the design of scientific experiments is so critical, especially the use of controls. The only way you can prove that something like an impurity is there is by proving you’re not putting it there. This research didn’t do that and that might explain why the FDA just recently dismissed all of the paper’s findings.